Bryan Hulbert - TULSA, Okla. (January 14, 2019) Rolling into Chili Bowl Victory Lane for the first time in his career, California's Logan Seavey was perfect in the first every Monday Qualifying Night presented by Cummins. Taking advantage of his Heat and Qualifier wins to position the Keith Kunz Motorsports No. 67 on the pole, Seavey led start to finish in Monday's 25 lap feature event to become the 44th different Preliminary Night winner. "To have the night we had, everything just fell into place and that's kind of what it takes for this race is for stuff just to go your way," commented Seavey of his evening. Rolling the bottom of the Tulsa Expo Raceway, Seavey quickly put distance over Brad Sweet who was under pressure from Brady Bacon. With traffic coming into play, Sweet with Bacon in tow closed rapidly on Seavey only to have the caution lights blink on for Hayden Williams with eight laps complete. Seavey rolled away from the field again as Bacon dropped the hub to challenge for the runner-up spot. Not able to clear the Oil Fire Whiskey No. 1R, the pair traded lines numerous times with Chase Briscoe working into the mix. Approaching traffic again, the red lights would bring things to a halt as several cars crashed entering the first turn. Thankfully, all driver involved were unharmed. Asked if the caution and red flag helped him figure on the track, Seavey replied, "I was kind of watching the screen and watching these two (Bacon and Sweet) battle side by side and I felt like the bottom was a little bit better there in the first half. That first caution came right when I got to lapped traffic, which you can't ask for anything better than that, then the second one was right when I got to lapped traffic. By then, I was starting to feel the bottom slow down and I could see Brad (Sweet) closing in on me and as soon as we went yellow or red and I had about half the crowd telling me to move to the top." Making the move to the cushion on the restart, Seavey would quickly put distance over the fight for second as Bacon continued his pursuit of the final lock-in spot for Saturday's feature event. Trading top to bottom again, Sweet bested Bacon until Lap 22 when Brady finally gained the upper hand off the second turn. Peddling as hard as possible with the leader hitting traffic at the white flag, time would run short as Logan Seavey crossed 0.887 seconds ahead of Brady Bacon. Third would go to Brad Sweet with Jake Neuman fourth. Chase Briscoe rounded out the top five. Oklahoma's Trey Marcham was sixth with Travis Rilat in tow. Moving up 13 positions after having to transfer from the first B-Feature, Indiana's Zeb Wise was the night's Hard Charger in eighth. Paul Nienhiser from 13th came up to ninth with "The Man" Sean McClelland moving ahead 10 positions to complete the top-ten. Monday's Cummins Qualifying Night saw 63 drivers on hand with five of those drivers ending up on the Chili Bowl Flip Count. All drivers were ok. 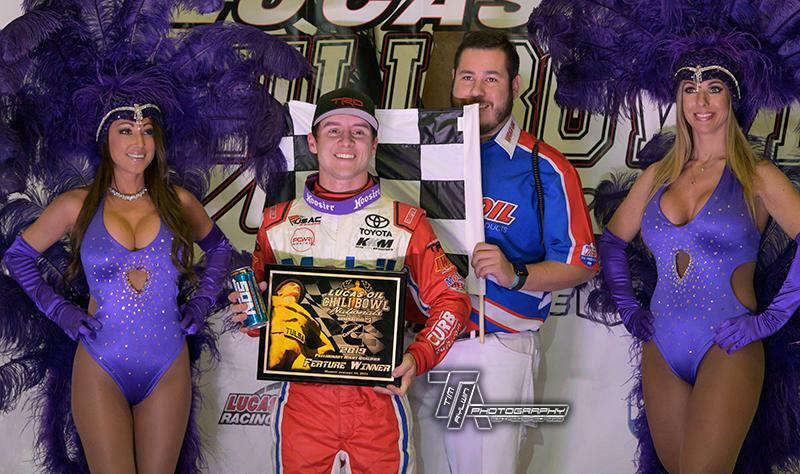 The 33rd Lucas Oil Chili Bowl Nationals presented by General Tire continues Tuesday, January 15, 2019, with Warren CAT Qualifying Night and the Vacuworx Invitational Race of Champions (VIROC XI). The River Spirit Expo Center will open at 9:00 A.M. with Pit Pass sales starting at 11:00 A.M. Hot Laps will get underway at 4:00 P.M. with racing at 5:00 P.M. (CT). A field of 72 drivers is scheduled to compete. Tulsa Expo Raceway - Tulsa, Okla.
A-Feature: Top 2 advance to Saturday's A-Feature.